Vegetable lasagna has been one of our favorite pasta. In Mangalore, we get the best lasagna in Diesel cafe. So keeping that taste in mind I created this recipe today by referring few recipe books. And believe me it was fingerlicking good filled with the goodness of cheese. Our house was surrounded with the aroma of cheese and the dish tasted just perfect. 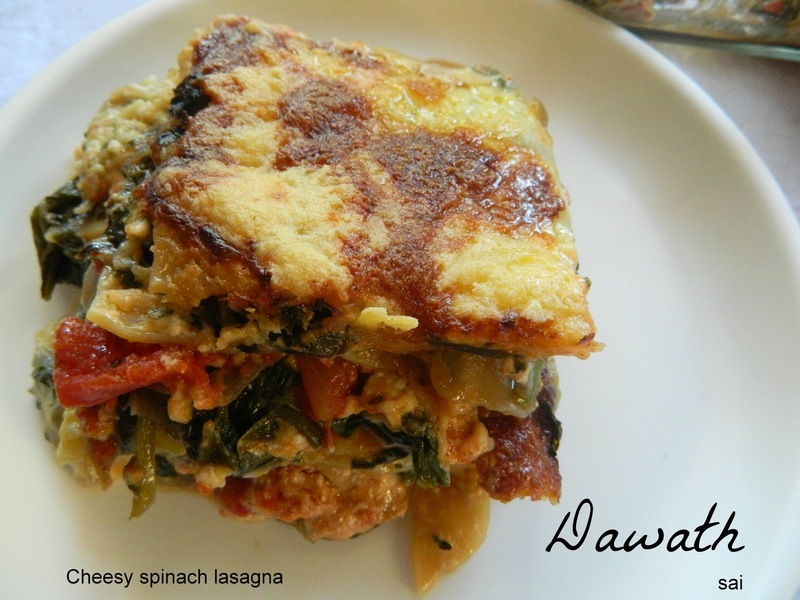 If you love Italian food I’m sure you’ll love this dish. You may make filling of your choice. You may add mushrooms or broccoli to make it more exotic. You may also do nonveg filling. 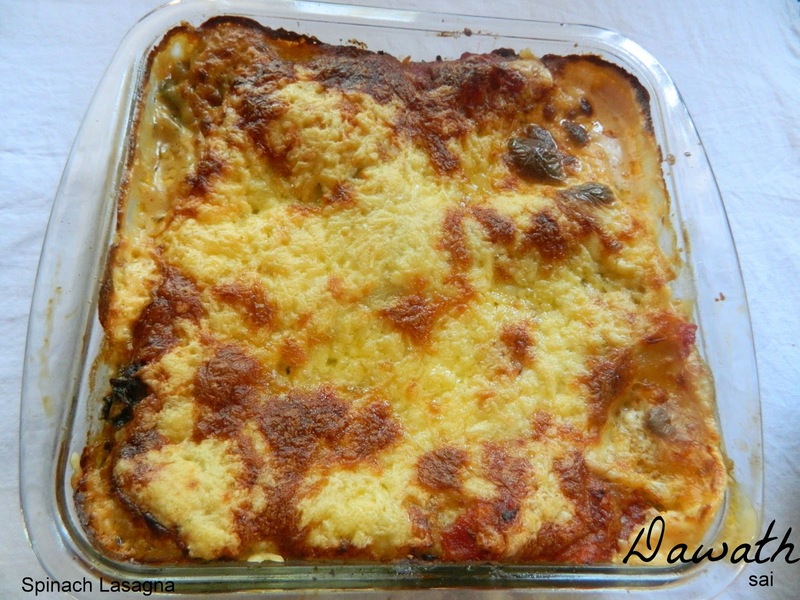 I used Spar brand Lasagna sheets which my friend Lakshmi had brought from Botswana and it did not need prior cooking and I was a bit scared, but it was cooked perfect and texture came out good. Take a nonstick pan and pour the packet of cream,add cream cheese and salt and give it a stir and off the flame. Heat olive oil in another pan and saute onions for few minutes,add chopped spinach,herbs and salt to taste. Cook for sometime and keep it aside. Preheat the oven for 15 minutes at 150 deg F.
Take a borosil rectangular dish and grease olive oil,spread some pasta sauce. 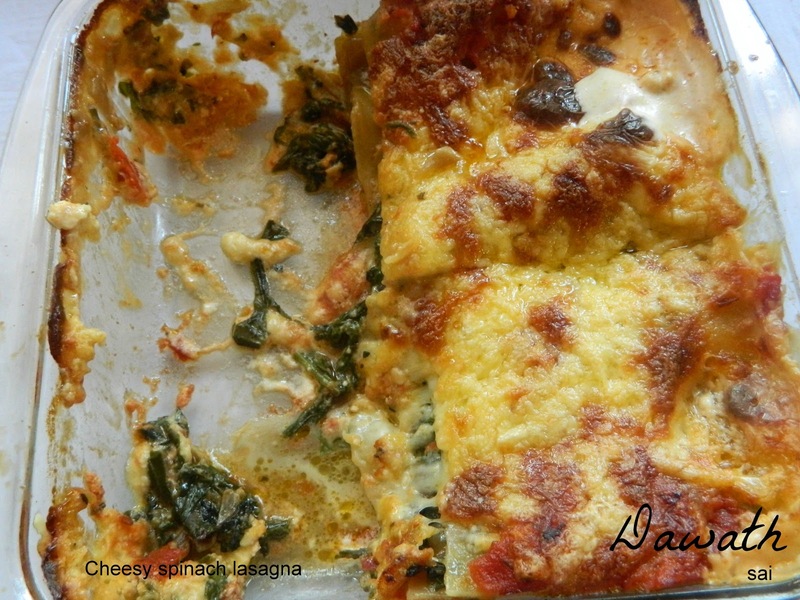 Arrange the lasagne sheets(I arranged 3 sheets in one layer). Next spread some cream cheese mixture,spinach mixture and grated cheese. Repeat the procedure until you finish and finaly garnish with lots of cheese. You may also garnish with herbs of your choice. Cover it with a foil and bake for 30 minutes at 150 deg F,later open the foil and bake for 10 minutes. Change the mode to grill and grill for 10 more minutes for browning the cheese. Once it browns take it out from the oven and let it stand for 15 -20 minutes before you serve. I used Spar brand lasagne sheets(imported) which instructed no prior cooking was needed so I used it directly. Just check the packet instruction of your pasta,some needs to be cooked for 8-9 minutes,then run it in cold water and drain it completely and spread it in plate or foil separately so that it doesn’t stick to each other. Please keep checking while the baking process is on as the temperature and timings may vary. Instead of readymade pasta sauce you may use fresh homemade sauce by cooking pureed tomatoes(2),spices,tomato ketchup,garlic etc or you may add only tomato sauce .